A lot of interior design and decorating choices are made on your willingness to take risks. Some homeowners are more cautious with their choices and this approach is perfectly acceptable as it is they who will have to live with their decisions. Others are willing to take a walk on the wild style and this is exciting too. 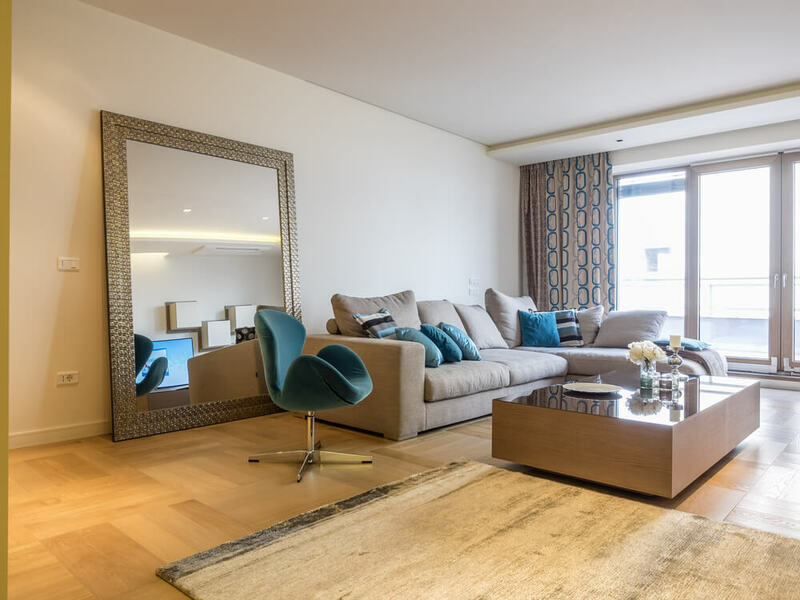 Regardless of your tendency toward risk-taking in interior design, the atmosphere and design of your home should in some way reflect your personal style and preferences. However, determining your personal style can be difficult, especially if you are new to this area of self expression. 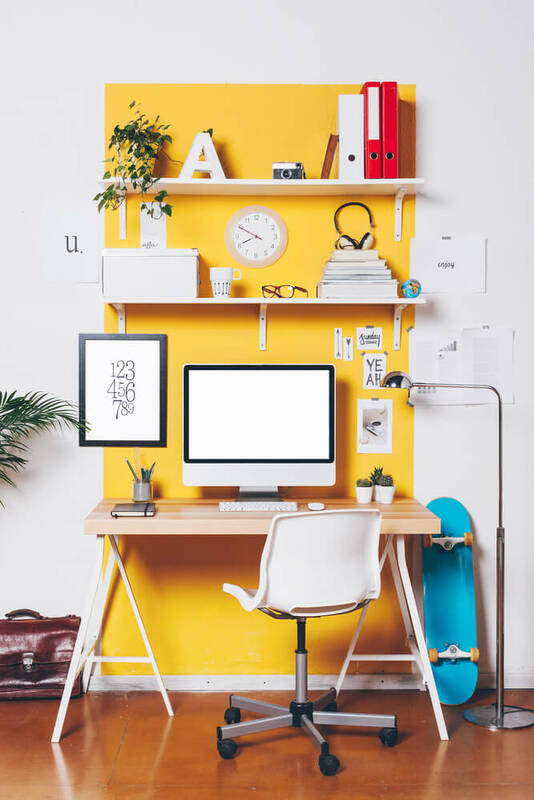 The availability of decorating magazines, blogs and websites can be overwhelming…and that’s before you start digging into Instagram for inspiration. But take heart, for the most part there are no hard and fast rules when it comes to design. 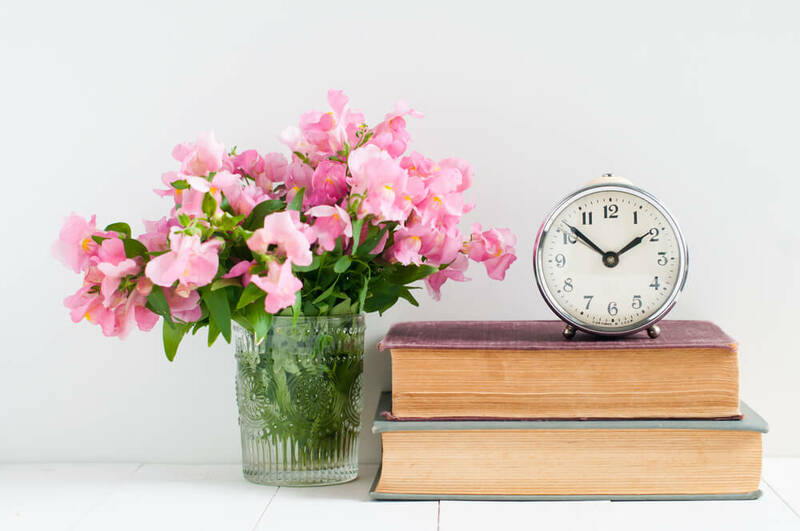 Well, not very many…and this article is designed to get you started in implementing of view of the decor and decorating ideas found in successful interior design. If you still feel lost and in need of some assistance don’t hesitate to contact your local interior decorator or designer to help set you on the right track. They are trained to help people make confident choices when renovating, designing and building their homes. When it comes to decorating with color homeowners tend to shy away from going too bold. In reality, painting your entire living room a deep teal blue is a confident decorating move. 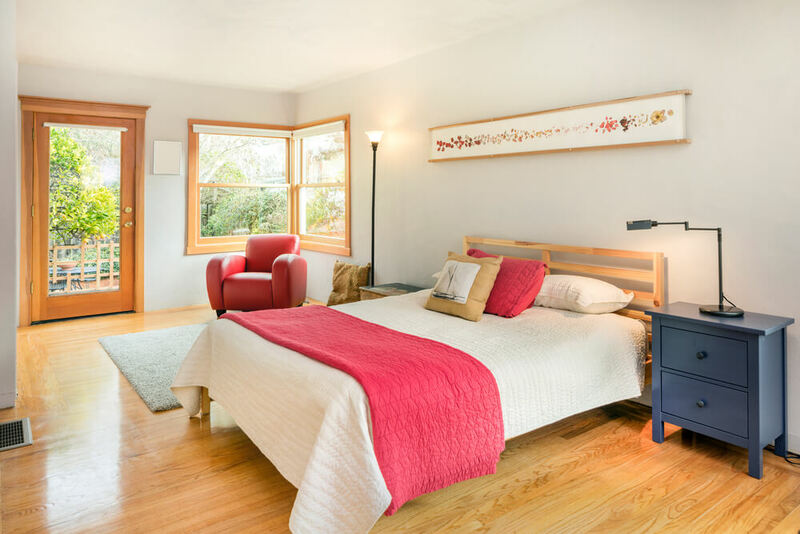 Thankfully, there are a number of ways to inject color into your home without necessarily covering all four walls of one room with one dominating color…unless you want to, then go for it. A complementary color scheme involves incorporating two hues from the color wheel that are across from each other. These could include combinations such as red and green, blue and yellow and orange and purple. When these color combinations are used in their purest forms the result is colorful, to say the least. Therefore you may want to consider using them as accent colors or choose versions that incorporate gray in them so as to make them more appealing for a wider audience. 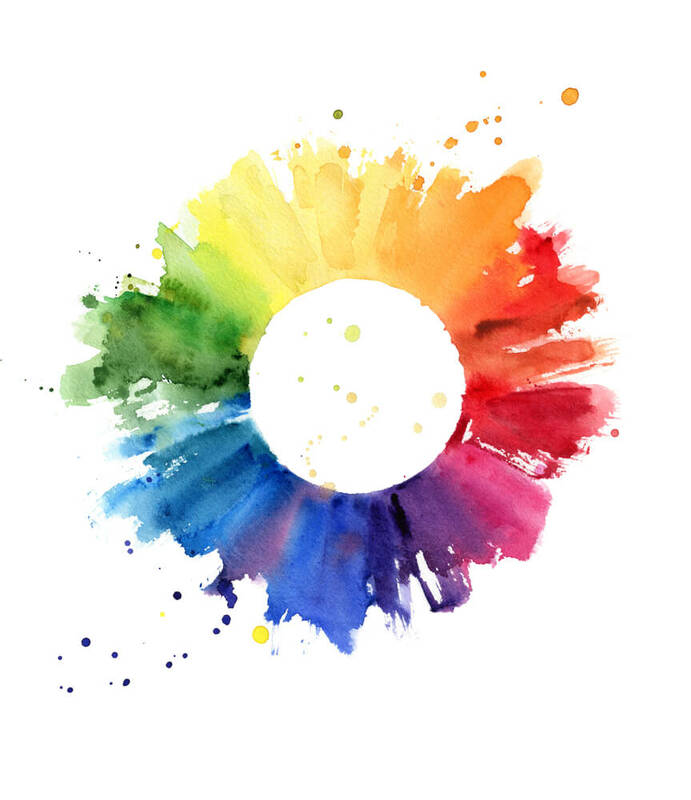 An analogous color scheme involves incorporating hues that are beside each other on the color wheel. An example color palette could be blue, green and yellow. Once again these colors do not need to be expressed in their purest hues when using them in your home. While the color wheel can be helpful in choosing the ideal color palette for your space, it is not always necessary. Sometimes you can look to your closet for inspiration. For example, consider your wardrobe and what color you wear most often. That color, unless it is a drab gray or taupe, may be a great place to begin establishing your color scheme. In contrast, if you never wear lime green or violet then these may not be the colors to use in your home…unless you are looking to make a significant change. The selection of pictures and ideas below are designed to show you simple ways of incorporating color throughout your home. 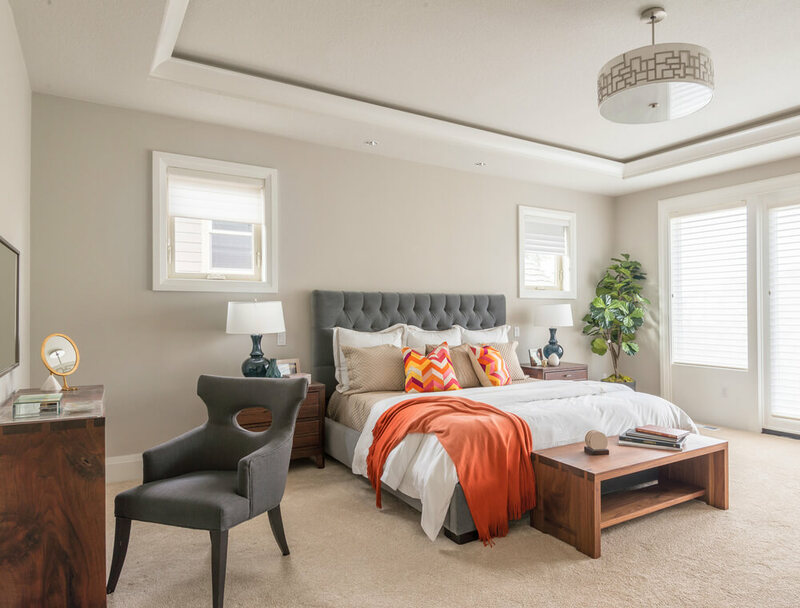 This bedroom does a great job of incorporating soft neutral colors with a pop of color. The color palette established with the feature wall, table lamps and accent pillows is analogous (the colors are located beside each other on the color wheel). The soft purple accent wall and elevated headboard create a striking focal point that adds interest to a room that lacks in significant architectural details. 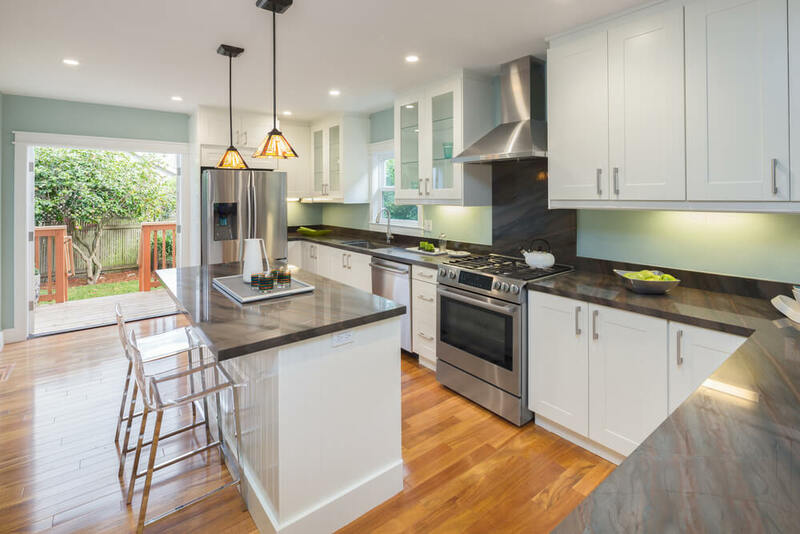 One way to incorporate color into your kitchen is by painting the island or lower cabinets a different color from the remainder of the cabinetry. 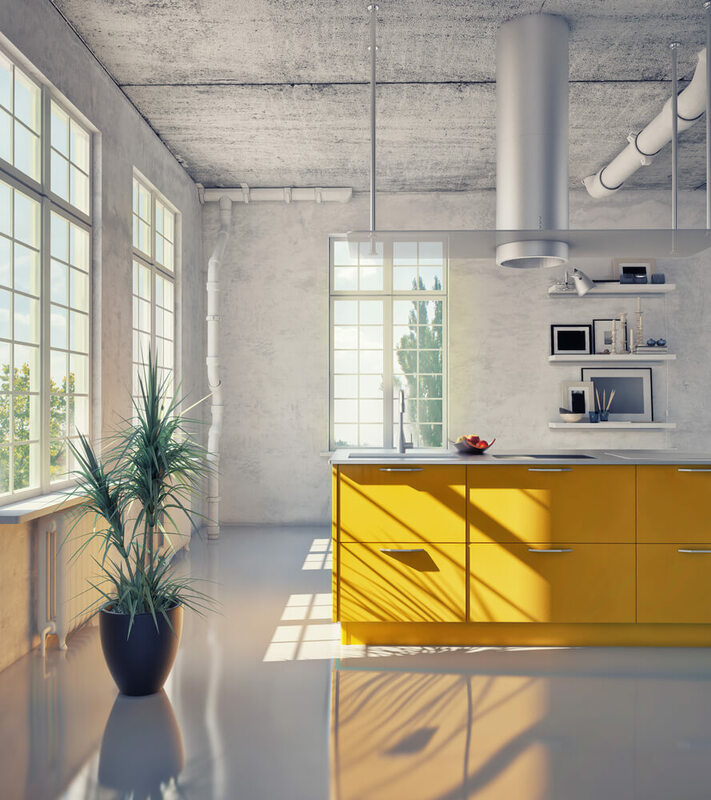 This is above in this loft space featuring a bright yellow island. This bedroom is decorated with warm gray walls accented by a tufted, charcoal headboard. The addition of a burnt orange throw and coordinating accent pillows draws the eye to the focal point of this space, the bed. 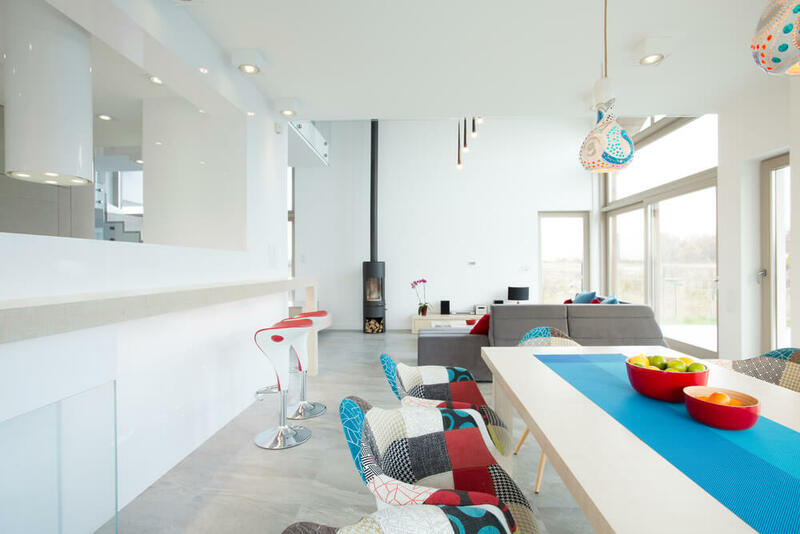 This dining room features a crisp white walls and concrete floors. The interest lies in the accent colors of red, blue and orange. These can be seen in the modern bar stools, table runner and unique, patchwork dining room chairs. 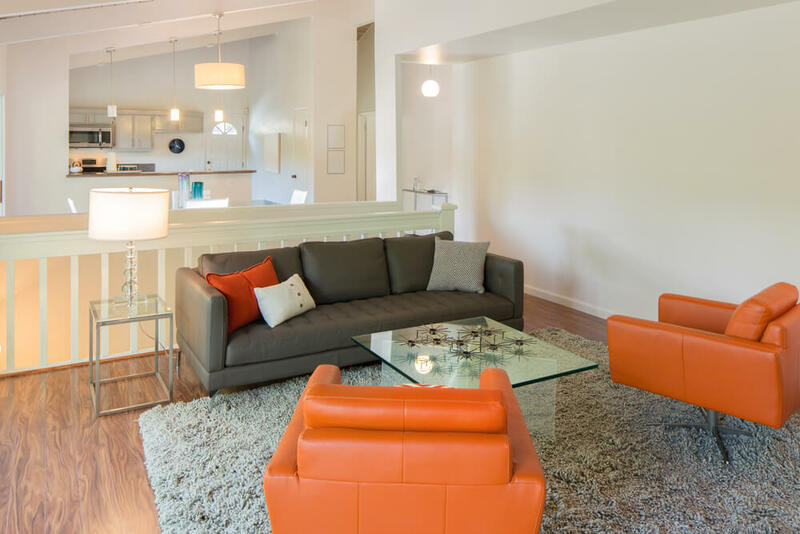 This neutral living rooms features two impressive, orange accent chairs. The sleek design, coupled with the vibrant leather upholstery, is the perfect addition to this contemporary space. A great way to add color to a bathroom is by accenting with colorful towels and, if possible, tile. 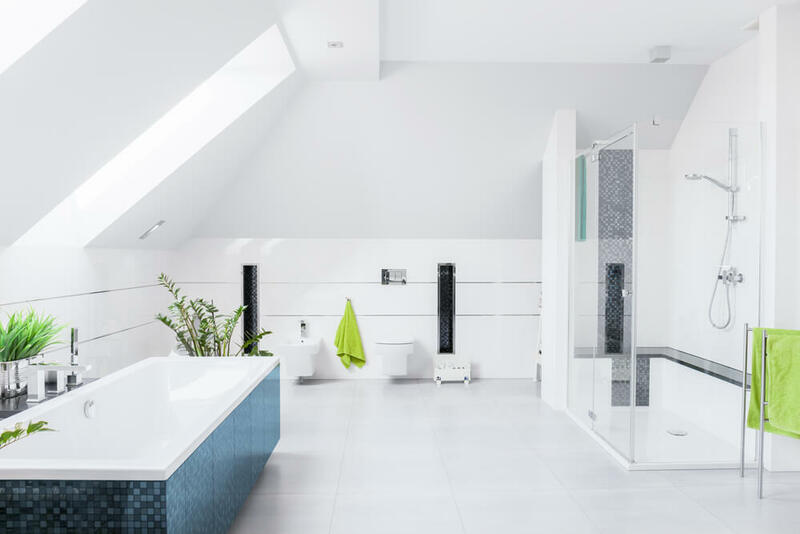 Even a limited selection of colorful tile can set a bathroom apart and create a custom feel in the space. The soothing color scheme of this bedroom is found in the large accent rug that grounds the space. The wall color and soft gray furnishings provide a neutral backdrop for a selection of vibrantly-colored accent pillows. The soft gray-green walls complement the space beautifully without detracting from the view outside. This kitchen features white, Shaker-style cabinetry and dark, solid stone countertops. The subtle green wall color contrasts perfectly with the cabinetry while coordinating with the greenery seen through the open patio doors. The color palette in this bedroom tends towards analogous with its use of bright pink and navy blue. The warm, hardwood flooring and gray wall color both work well with this combination of bright and neutral textiles. 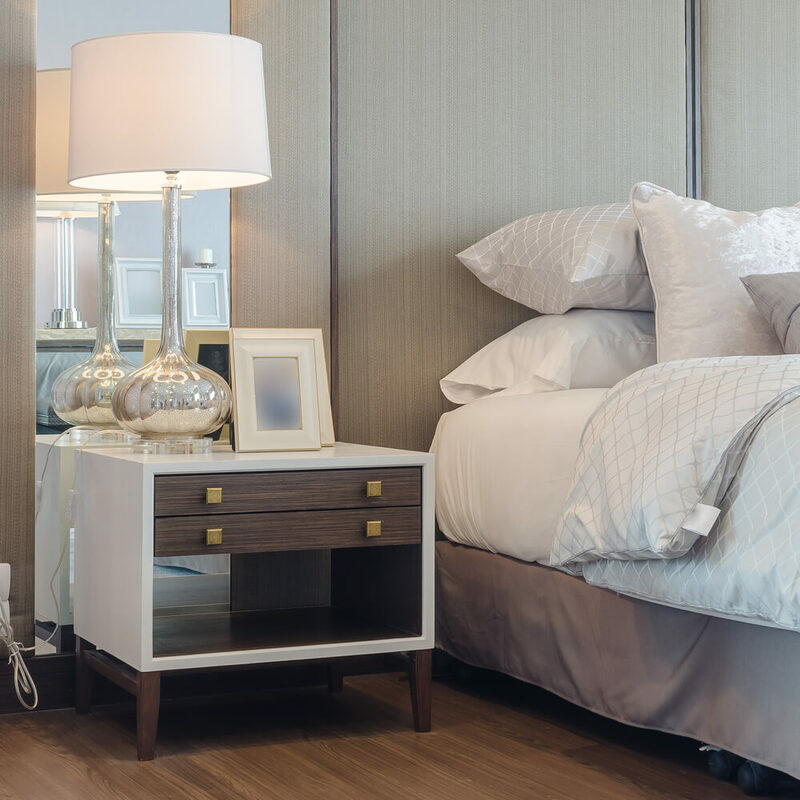 From the living room to the bedroom textiles play an important part in making comfortable and inviting. They can also act as a jumping off point for the design of a room. For example, a large area rug featuring your favorite colors can provide the foundation for the color scheme in the room. By incorporating two or three colors from the rug in accents throughout the space such as pillows, decor and curtains, the room will immediately appear to be cohesive and well-designed. However, this doesn’t mean that everything in your room has to match, in fact it’s better if it doesn’t. But it is important to maintain a style and color palette throughout that is both appealing and complementary. When it comes to the bedroom the right bedding can make all the difference in transforming a regular bed into a sumptuous spa retreat. When choosing the ideal sheet set for your bed make sure its Egyptian cotton because cotton grown there is of the best quality. The other thing to look for on the label is thread count and make sure that it is at least 200 thread count. However, the greater the thread count doesn’t necessarily mean the best quality, especially if it isn’t Egyptian cotton. It’s all about the Egyptian cotton. 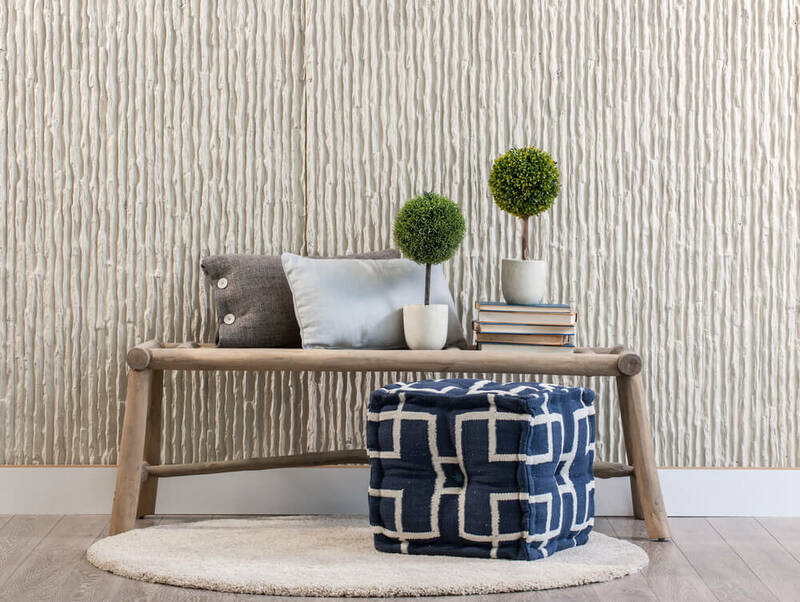 The last thing to consider when thinking of the textiles in your home, especially those that serve both practical and decorative purposes – window treatments, seating upholstery, area rugs – is who will be using them. If you have small children or a home that is frequented by small children then it is extremely important to decorate with textiles that are durable and stain-resistant. Indoor/outdoor rugs are a great option in spaces like this because they are extremely durable, as they are meant to be outside, and they tend to repel water and stains better. 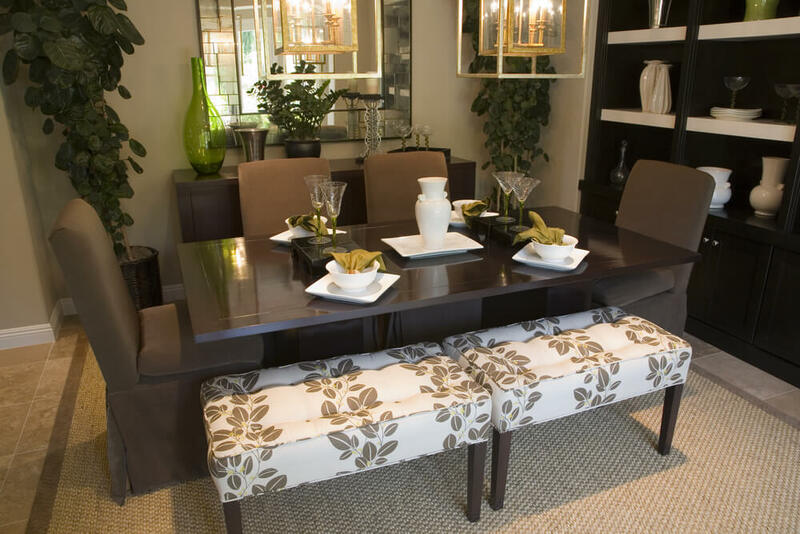 Using indoor/outdoor fabric for upholstery is another way to ensure that you get the most out of those dining room chairs. On the flip side, if your home or the room you are decorating is more of an adult space then you can indulge in luxurious textiles like silk drapes and wool rugs. The graphic black and white rug in this dining room helps to anchor the dining room table within the space. It also provides a soft place underfoot for those sitting at the table. 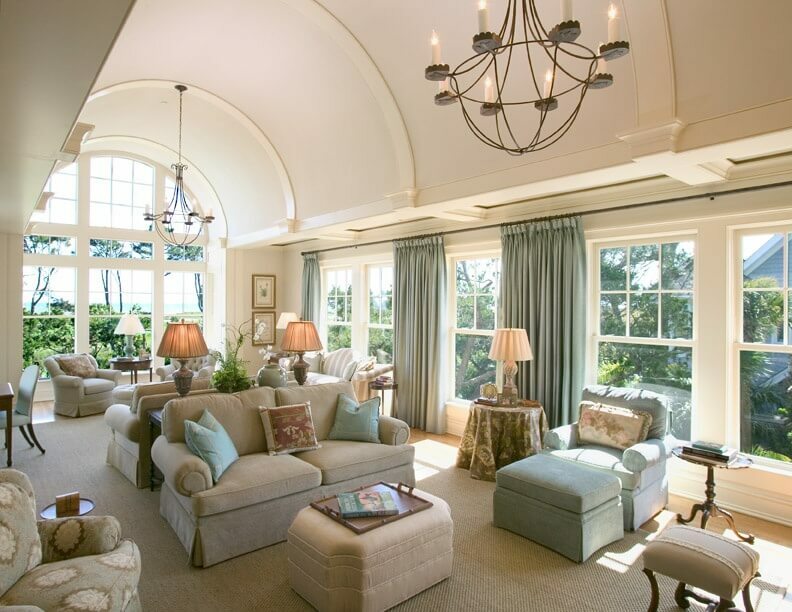 Window treatments should always be wide enough to adequately cover the entire window, even if they are rarely closed. By hanging a third panel in the middle of the large window it creates the illusion that the window is much larger then it really is. In a living room, an area rug is ideal for giving the space an anchoring point for the placement of furniture. This area rug successfully draws the eye to the conversation area while also hiding the less-then-desirable flooring. 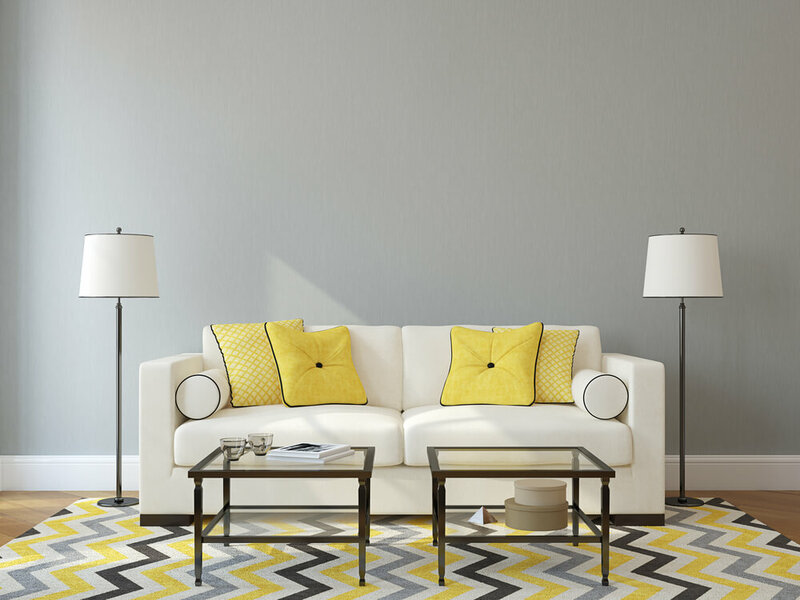 This vibrantly-colored, chevron area rug fills the space with light and energy. It also provides a jumping off point for the furniture and decor in the space. Yellow throw pillows and black accents coordinate nicely with the rugs colors. 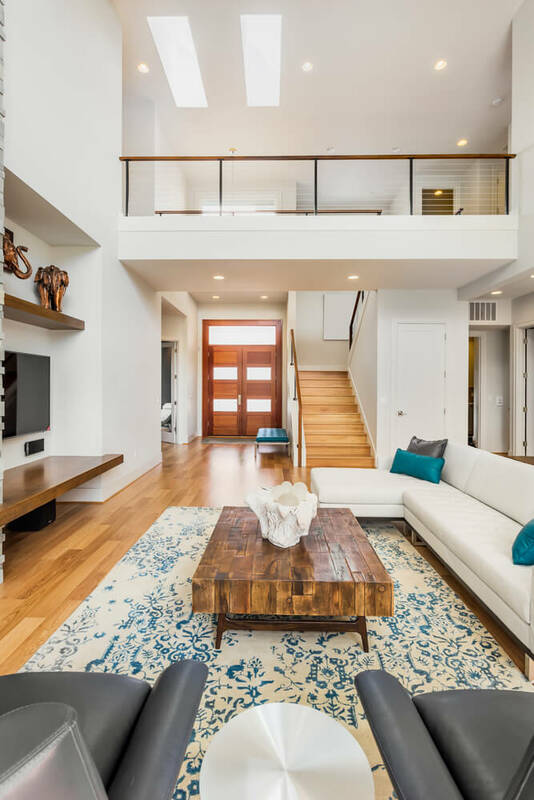 In open concept spaces, like the one above, an area rug provides a much needed anchor point for the positioning of furniture. This area rug does just that beautifully and its size is perfect for the space. You never want to go too small when purchasing an area rug. 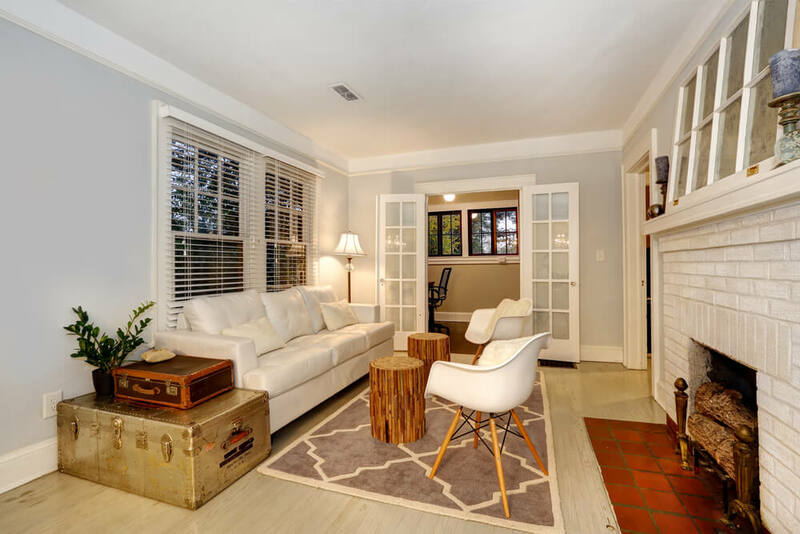 The legs of the surrounding furniture – couches and accent chairs – should at least touch, if not rest on the rug. 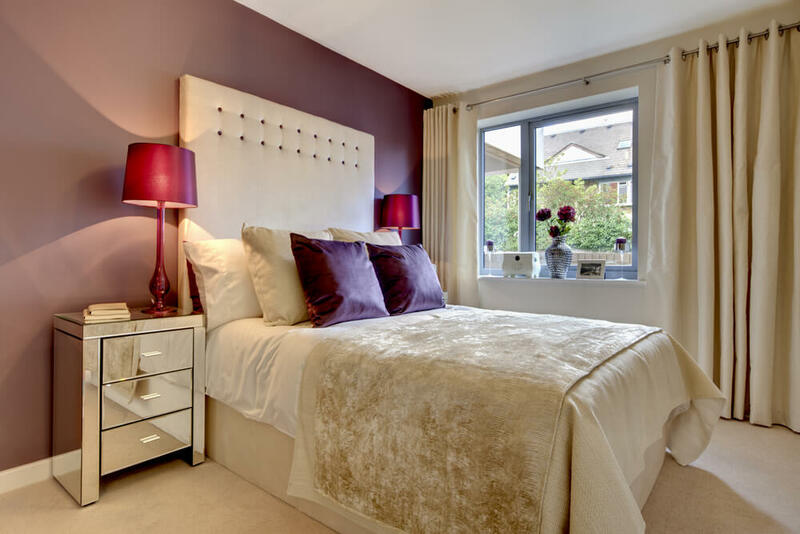 As you can see in this bedroom, the right bed linens can really make a room. The combination of graphic accent pillows and pillow cases in soft neutral colors adds visual interest without appearing too busy or overwhelming. This is a great look for a bedroom as it is relaxing and restful. This floral rug provides inspiration for the colors of the room. The chocolate brown sofas, upholstered ottoman and accent chairs all reflect the colors seen in the rug. In addition, the combination of floral and striped patterns is executed successfully by keeping the color palette the same. This dining room is a great example of how to use textiles in your overall design. The sisal rug helps to create a boundary for the dining room space, as well as adding texture and interest. The tufted benches are upholstered in a coordinating color that creates a cohesive design without appearing too matchy-matchy. 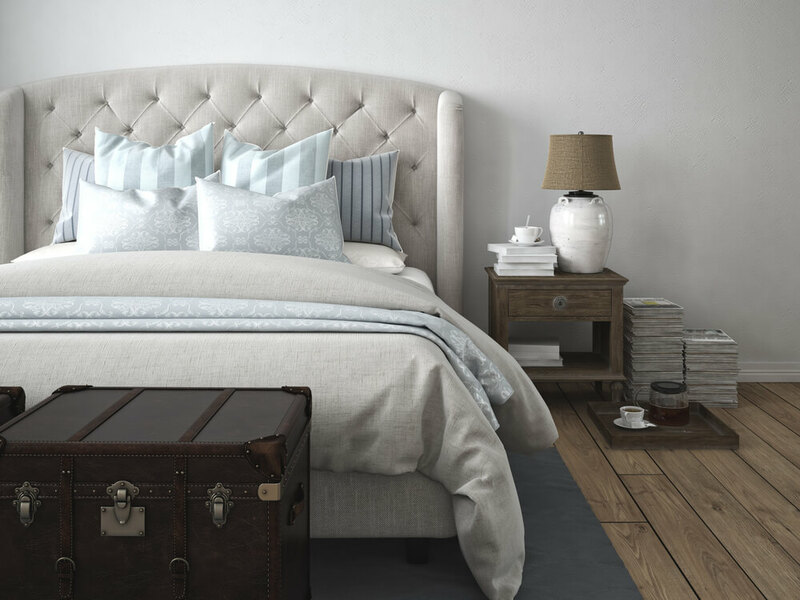 While decorative accents may often be overlooked in the decorating process they are truly what puts the “cherry on top” when it comes to a successful room design. Decorative accents and wall art add interest, color and much needed personality to a home. This is often where a homeowner’s beloved collection or favorite family photos will be displayed. Group collections and similar objects together. A curated collection of items always looks best together because it displays the grouping in its entirety. Even items of different sizes, heights and colors can look good together if they are contained within the same space. 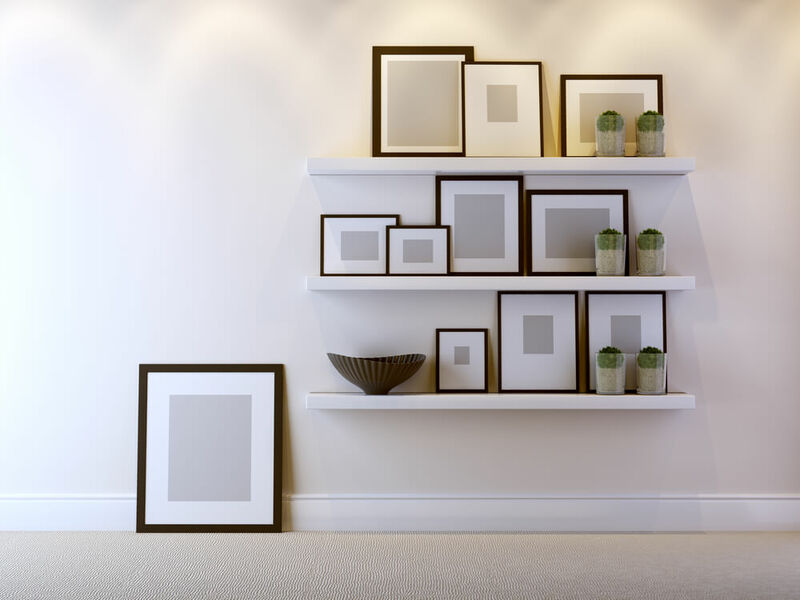 A great way to showcase your art collection or collection of family photos is by displaying them on a gallery wall. The great thing about a gallery wall is that the pictures and frames don’t have to match, you can include an eclectic mix of pictures with as much variety or structure as you like. Just make sure that there is a good balance of color throughout the gallery so that it doesn’t appear to be lopsided. It is also helpful if you base the collection off an anchor piece (a favorite photo or painting) and work around it. If you aren’t up for hanging a gallery wall you can opt for a series of picture ledges where it is easy to make changes to your collection on a regular basis without having to rework the entire display. Even everyday objects can be used to decorate with. 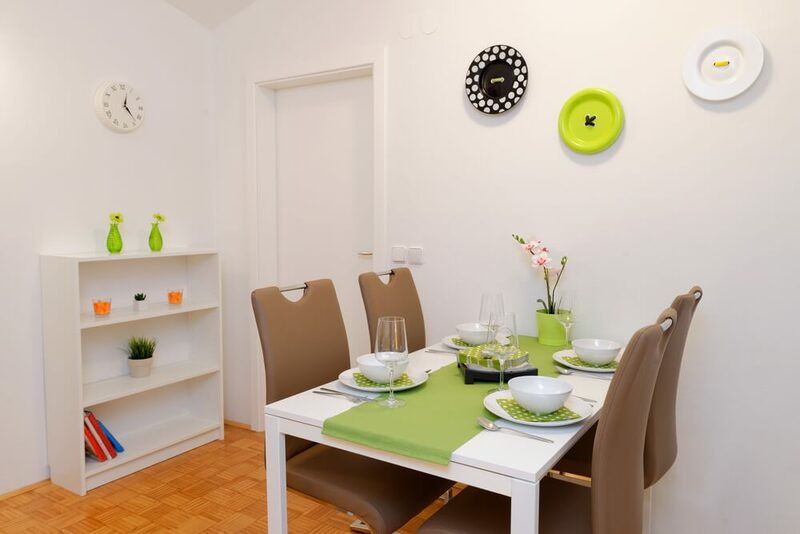 For example, a collection of white, ceramic vases can be used to house kitchen utensils on a countertop. Or a regular bookcase can be used to display your personal library, as well as a combination of decorative and sentimental objects. To get an idea on how how to add the finishing touches to your home’s decor, check out the pictures and ideas below. This collection works well together, despite the varying sizes of pottery, because each item falls within the same range of color. A small vignette is a great way to display a small grouping of favorite objects that reflect a bit about your home and your personality as well. 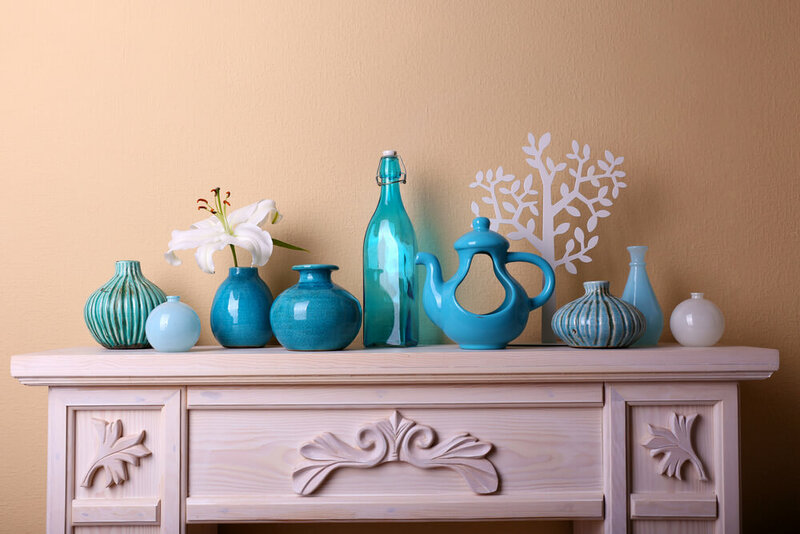 You can set up this small vignettes throughout your home on a open bookcase, on a side table or above your piano. Decorative wall art doesn’t always have to be what is expected. The collection of large buttons works in this cozy dining room because the colors coordinate perfectly with the space, as well as adding a touch of whimsy. This may seem counterintuitive but artwork does not have to be displayed on a vertical surface. It can be displayed on the ground as well. The arrangement above displays this by incorporating a combination of artwork on the wall and sitting on the floor. This is another example of a vignette. 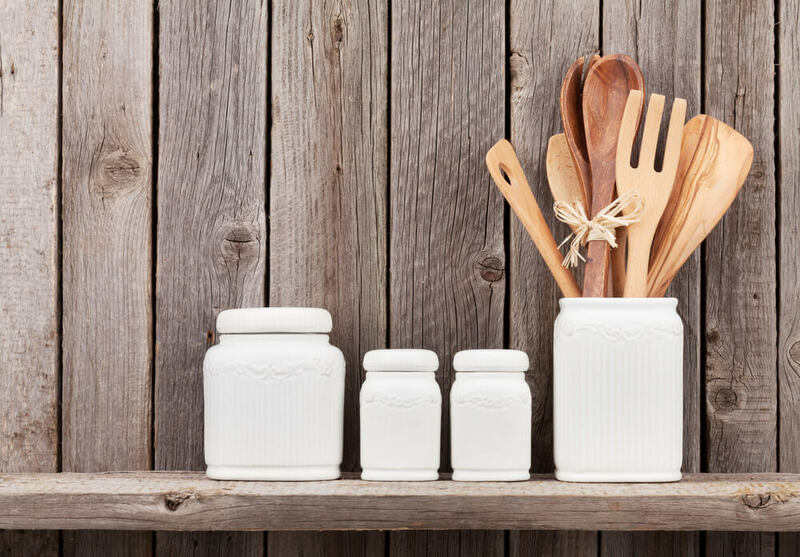 A collection of decorative canisters or vases can be used to house everyday kitchen utensils in an unexpected way. This way of displaying household objects takes them from mundane to beautiful. As mentioned earlier, a great option for those who are afraid to “commit” to the permanence of a gallery wall is displaying artwork on a series of pictures ledges. This frees up the homeowner to switch out pictures and canvases as their mood dictates without having to concern themselves with finding the right frame to fit in a certain “hole” in the gallery wall. In keeping with the natural theme in this bathroom, the decorative objects displayed are made of natural elements like wood or stone. A touch of greenery, albeit artificial, coordinates well with the warm wood paneling. You may have recently noticed the popularity of natural greenery in interior design and decor as of late. One plant commonly seen in the homes featured in decorating magazines is the fiddle leaf fig tree. Not only do plants help to freshen the air that circulates in homes they are also great for providing a pop of color in a lonely corner or niche. This unique entrance side table doubles as storage and artwork. 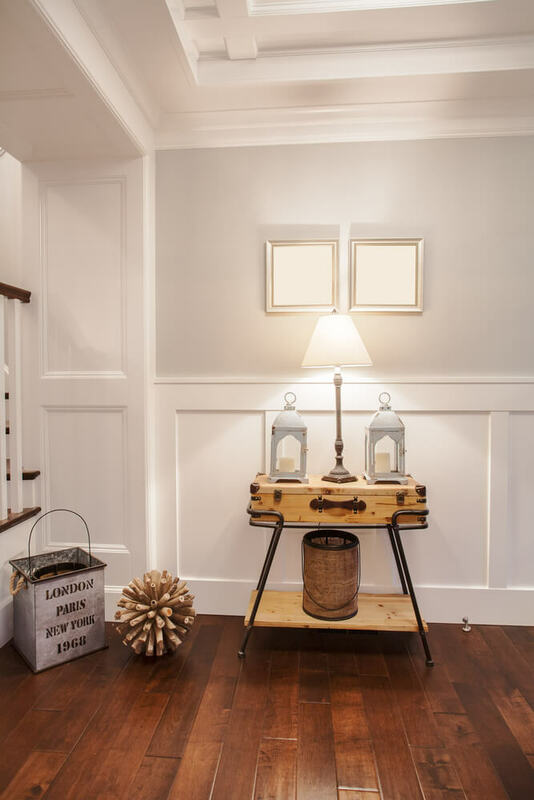 A small lamp located on top of the trunk supplies the room with light while drawing attention to this unusual entryway table. A large mirror, whether hung on the wall or placed on the floor, is a great way to create the illusion of a larger room. 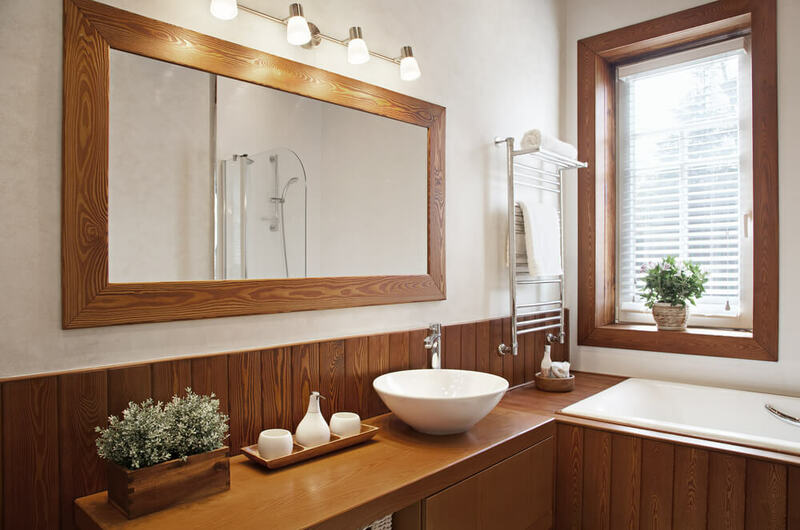 A mirror does this by reflecting the available lighting in the space and reducing any dark corners or niches. By looking into the mirror, the image seen is one where the room seems to go on and on, therefore making it seem that there is additional square footage.